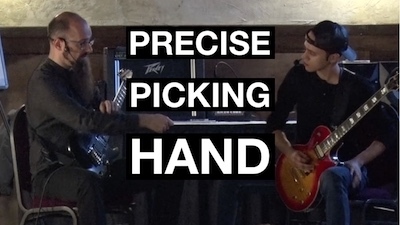 A problem I see very often in guitar players is that their picking hand is slow and imprecise. This happens especially when playing rhythm guitar in rock and metal, where consistent and precise down picking is a must to get an aggressive sound. Now that we took care of the technical part, if you want to learn WHAT you can play as a rhythm guitar player, then take the Complete Chord Mastery course that will help you explore the wonderful world of harmony applied to guitar.